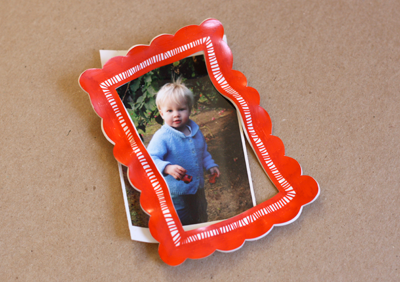 See this plastic picture frame? It was going to be a cute little desk frame for wallet-size photos, made with the plastic shrink film you heat in the oven. Except it curled up like a piece of bacon. Maybe Salvador Dali would have appreciated it, but I threw it in the trash. An inkjet printable product gave me good results once before, so I opted to try the white, non-inkjet sheets made by Graphix (purchased at a local hobby shop). 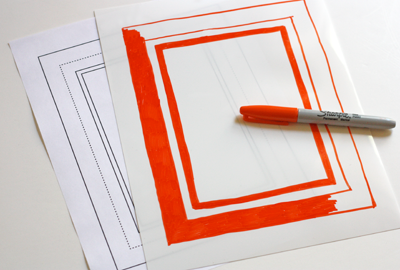 I made a quick paper template to trace, sized 200% larger than the final frame would be. I traced it onto the plastic sheet and colored it with a permanent marker. Then I cut out the front of the frame, a piece for the backing, and a stand to attach to the back. I baked the front of the frame for three minutes on a piece of cardboard with a sheet of parchment paper on top to prevent curling, per the instructions. Here's the before and after. Boo. This is what it looks like after I flattened the hot frame with a spatula. I tried another one and it was even worse. Here's the back piece for the frame. It used to be a rectangle. I tried placing a thin sheet of cardboard on top of the parchment layer to hold it down during baking, and the plastic went crazy. I plan to submit it to a modern art museum where it will fit right in with the rest of the objets d'art. This thing just went from a cheapo craft project to a sculpture worth thousands. Awesome! Ha! Love your attitude. Too bad it didn't work--however, you may have just accidentally discovered your hidden penchant for modern art. Look out; I'm going to be a millionaire. Hey Frank Gehry gets his ideas by crumpling up paper and seeing what happens. You've discovered another way to create the next civic complex. Yeah, forget placing these sculptures IN art museums. I'm going to design the museum itself. I imagine a way you could make it work is to place the object between two baking pans and put some weights on the top pan...kind of like using pie weights for pie crusts. I'm not sure how well the frame would shrink but it at least won't be crumply...worth a shot? i see the art in that melted plastic. it looks like a bullfrog! Aww, yeah, sometimes things don't turn out how we imagine them. Or we think it looks SO simple, but turns out it's not. I love that you posted your attempt anyway. Your post title caught my eye on my blog side bar because I'd just posted about my botched attempt at chocolate-covered kiwifruit pops. Yeah...they didn't turn out quite like the pretty picture I was following. But hey, we learned some things for next time, right? yes you can still use that shrink , keep heating it and it will eventually flatten out again!!!! I've had a hard time with the Grafix sheets, too. I find that the Shrinky Dinks sheets flatten out better. Place the plastic on a piece of newspaper on a cookie sheet. Then place another piece of newspaper on top and another cookie sheet. So: cookie sheet, newspaper, plastic, newspaper cookie sheet. That helps keep them flat. :-) great idea, at least! i love the edging... it's very Dr. Seuss now! I actually think it looks kind of neat all curled up! You could try the 'Museum of Bad Art'? So, I work with Shrinky Dinks all the time, I make jewelry out of them, and the cut if not perfect will ripple and curl. I am not sure about the ones you used, but with SD's and an off brand I found at Joann's, I have about 10 seconds after it is out of the oven to mold them, so, if it is curled, and I need it flat, a lot of the time if I stick something really heavy on top of it, it flattens out. If you wait too long though it will crack and break, but while it is still flexible--Not sure this helps, but I love your projects!! Yeah, I've heard nothing good about the Grafix sheets. However, the actual Shrinky Dink ones work really well however. I've ordered from their site and they ship super fast. To make the plastic really flat and straight, put a heavy book on top of them when they come right out of the oven. I think the wavy frame would look really cute glued to a flat frame of non-shrink plastic (make the back out of non-shrink, too), so that you can keep the picture flat while still having the more interesting frame. Now go dig that back out of the trash! When your art is worth millions (oh, wait, maybe it is already) I can say "I knew you WHEN", tee hee. funny, normally i look at the pictures frist, then I read the artical. When I saw the "back of the frame" I actually thought that it was an piece of modern art! You could make millions!!! I love that frame! 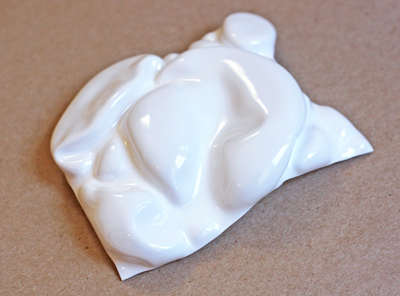 It looks ready to embellish as an ornament to hang on a tree, or add chimes, or magnet for fridge art. You rock! Oh I love that you posted about something that didn't work. Isn't that just as much a part of the whole process as the successes? I'm seeing a snow-covered landscape waiting for tiny penguins or polar bears. Aw. What a pity it didnt work out. 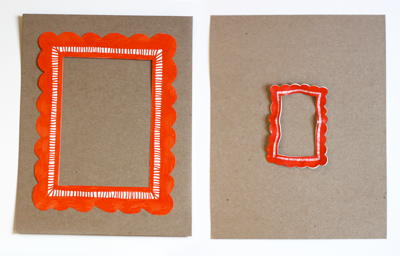 How about try to make a paper frame instead? I made one here at greengaleprints.blogspot.com/2011/05/diy-photoframe.html, maybe this might inspire another great idea of yours? Funny, I just tried making earrings with the grafix white sheets yesterday and they did the same thing. Since it was earrings, the curl looked pretty cool, though. Oh no - don't throw it away! You can just bake it longer. The bigger pieces will curl up like that, but keep baking them until they flatten out. Haha :) Love this post, because this is more often than not how my crafts end up. just wondering if you'd seen this in your fabric- love it!! I would carry on heating it, looks like it needs a bit longer. I use an embossing heat gun to shrink my shrink plastic, their fairly cheap. (Or you or your mother may have one already?!) I find you have more control over what your doing other than using the oven. Heat them some more! You've nothing to lose! Except the trash has been thrown out. :) Oh well! Rohanknitter, that bag is lovely! I hadn't seen it before, and just got it added to the Oslo Flickr group. Caro's work is awesome. Sorry that didn't work out for you. But it's nice to know stuff like that doesn't only happen to me! if you have an embossing gun, it may also work and give you a little more control over the poly shrink. I've had this problem with my daughters shinky dinks crafts. The last box we bought had a tip sheet in it. Two tips I remember are to heat the pan in the oven before you transfer the pieces and sprinkle some baby powder on the surface to help the shrinky from sticking as it does its thing. It worked for us! Like some other have said, I actually prefer to use a heat gun to control the shrinking. You do need to make sure you have some good ventilation. Don't want to be breathing those fumes in too deeply. Also, instead of buying the crafty plastic you can use the top of a take out container - you know the clear plastic things they put on top of the aluminum take out containers usually from the Mexican restaurants. You can also use the all plastic containers that berries come in or cupcakes from the bakery section, - you want the ones with a #6 in the recycle logo. I second the heat tool idea and yes, just keep heating it as it curls then flattens. I also put a heavy object on top as it cools. Good luck!!! I used grafix to make name tags for a group I'm in. I had to adjust both the time and temp of the oven. It was trial and error. I also would have to open the oven and mold it a little and then let it keep baking. Good luck and try it again! When I run out of grafix I will probably buy shrinky dink paper although it's more expensive.